On January 22, Sacred Heart made the very short trip to De La Salle for a district match-up. The Cardinals were off to a slow start and had trouble finding the bottom of the net in the first half. They made adjustments at halftime and were told to keep shooting, and hopefully, their shots would start to fall. Their patience paid off, and they went on to score sixteen second-half points. The scoring drive was lead by Mykhala Coleman '21, who finished with nine points, followed by Lillian Balart '22 with four points, and Kate Ellis '19 with two points. On January 26, the Cardinals hosted seven teams for an all-day JV tournament. 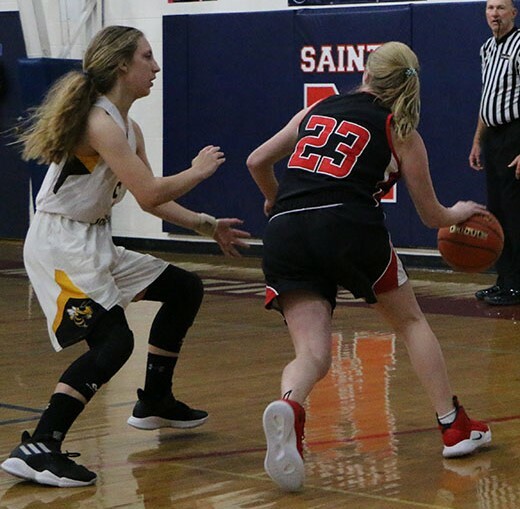 The Cardinals competed against Ursuline and Dominican, and although they started out slow against Ursuline, they were awake and ready to play against Dominican that afternoon, which happened to be one of the best teams in the tournament. With only seven players, they kept up with a very talented Dominican team and finished the day with their heads held high. It was a great experience for everyone and a great opportunity for all to get some valuable playing time against quality opponents.